When we were moving our son to college, we loaded up his belongings in the back of his grandfather's pick up truck and that's when we saw the rain clouds! How were we going to protect the stuff and keep it from getting rained on? As we were driving into town we noticed lots of other parents with various pick up trucks and trailers in assorted states of undress. That's when Michael began to imagine a better way to cover a truck bed. He envisioned a sticky plastic covering that doesn't need bungee cords or ropes and keeps off the rain! The idea for Bedder Covers was born! Our daughter came up with the name and our friend designed our logo. We are a small family-run business. 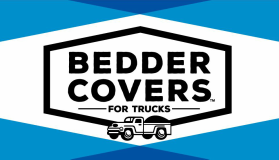 Our Bedder Covers are better!